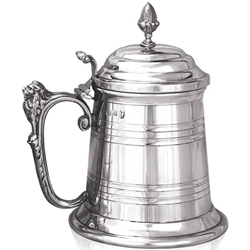 Our Extra Heavy Gauge Mountbatten One Pint Pewter Tankard measures 5.11 inches tall by 3.14 inches wide. Pewter is the fourth most precious metal in common usage, behind only platinum, gold and silver, and this beautiful extra heavyweight one pint tankard clearly reflects the precious nature of the raw material. The traditionally beautiful appearance of the tankard is provided by a straight sided body with an impressive lion handle and a hinged lid that sports an acorn adornment at its peak. Composed of the thickest possible gauge metal, this 1 pint tankard offers a great deal of substance to compliment the undoubted style, and can also be expertly engraved to turn it into a truly unique gift for any occasion.